Sophos remains a Leader this year because of its strong ongoing focus on enhancing advanced malware prevention capabilities through its firewalls and endpoint platform integration. This year marks Sophos’s strongest showing ever in the Leader’s Quadrant for UTM, and it’s now in the seventh year running as a leader in this space. Its still remains part of a Trinity that is placed in the Leader’s Quadrant, is also placed furthest right representing Completeness of Vision. Sophos is a leader for the seventh year in a row. Sophos is one of only three leaders for the last three years. Sophos is placed furthest right for completeness of vision. Both Fortinet and Checkpoint have decreased in completeness of vision this year. 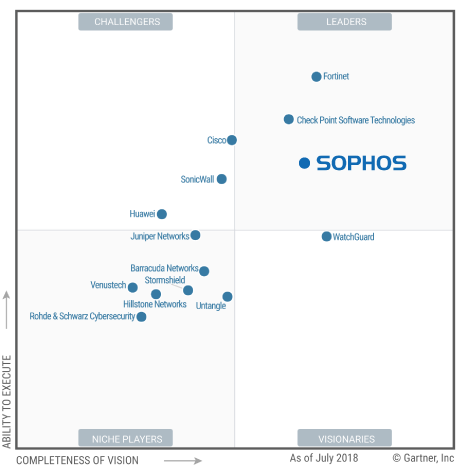 Sophos continues to be the only IT security vendor who is a leader in both the Endpoint and UTM MQs. Gartner mentions a few reasons why Sophos has been outstanding this year. Its strong focus on malware protection including ransomware protection. Its leadership in endpoint integration, Synchronized Security, and Synchronized Application Control. Its ease of management and central management platforms. Its strong UTM feature set. In conclusion, Sophos is a good candidate for SMEs that are looking for multiple integrated features, such as email and web DLP, email encryption, and a web application firewall in their firewall while also being a strong and mature endpoint for integration capabilities within their UTM solutions for ease of management and correlation of events.